This is a continuation from a previous post. From what I read in The Tanks of August, the three Georgian tanks executed what in US Army doctrine is called an "attack by fire" tactical mission. Seemingly the simplest mission (fire at the enemy), it actually requires thought and planning. The first and most fundamental thing for myself as a tactical leader is to know is my own weapons, how to use them, the effect they produce on the enemy, and last but not least how good is my team using them. Crewing and firing the T-72 M1 in Steel Beasts ProPE requires some serious hands-on time. After fighting in the Abrams and the Leopard, sitting in the T-72 is a bit of a shock. 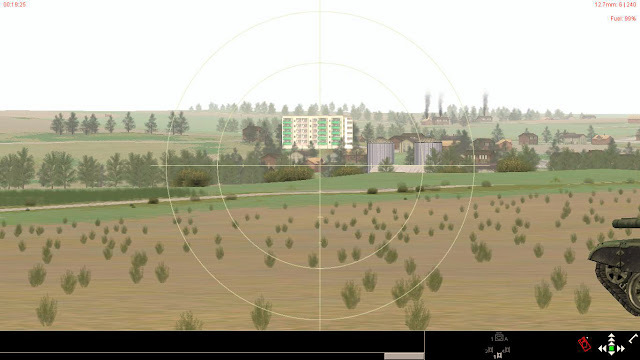 The gunner's primary sight. This is used to aim and fire the main gun and the coaxial 7.62 mm gun. The small red dot is the laser range finder's aiming reticle. 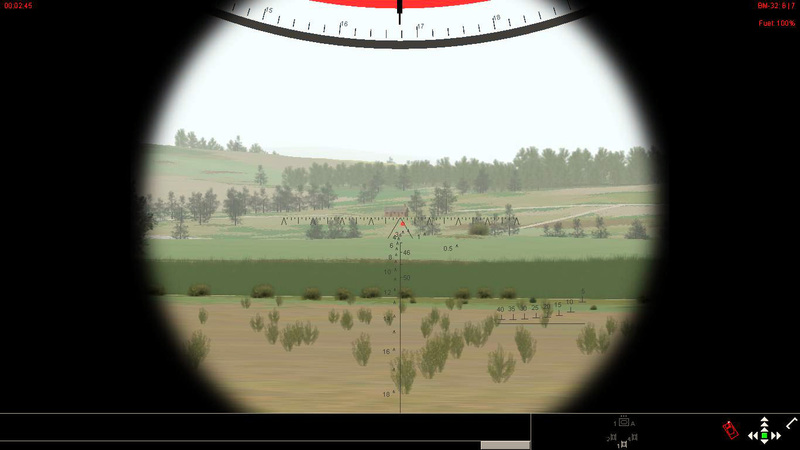 The main gun aiming reticle is the horizontal series of carets and marks in the center.The magnification is fixed at 8x and there are no usable thermal sights during the day. Maximum range I engaged as a gunner are 2.2 Km (tanks and troops) with the main gun and 600 m with the coaxial gun. The gunners "office". I frequently get my virtual eyes off the primary sight and take a double check at the ammo select switch (below and slightly left the right ocular) and the ballistics computer switch light (bright green light to the top of the screen). 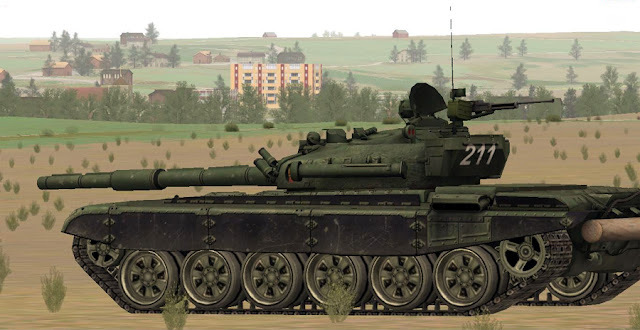 The T-72 M1 has an auto-loader for the main gun rounds. 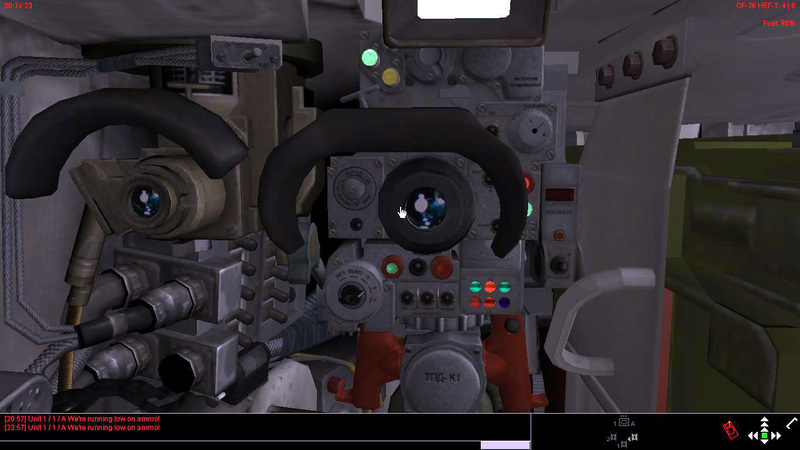 When sitting at the commanders hatch, the piece of weaponry I get to fire is a heavy machine gun (12.7 mm) that was originally intended for air defense. The screenshot above shows this gun's sight. This gun is slewed with the joystick but the pitch is by hand-cranking (up and down arrows). I have dropped enemy infantry at ranges up to 900 m with this gadget. The next thing is to know the enemy, his troops and armor numbers, his position and his probable course of action. That comes only from a good reconnaissance. In this mission we know the enemy is stationary and entrenched in a camp. The tactical map for this mission. The enemy is located at the red icon and my Georgian T-72 tank platoon is the blue icon. Never plan a tactical mission from a map alone! In this case I will first recon the enemy position and the surrounding terrain from 2 or so Km away. The purpose is not only to gain as much information as possible about the enemy but also about which battle positions and routes between them are the most suitable for the mission. The blue arrow is a possible route to approach a vantage point. Stay tuned for the next post, in which I drive to the observation position to reconnoitier the enemy position. You should really use a bigger segment of the map for your tactical missions - the artifacts caused by wrapping the edges occupy almost a quarter of the available space - the route you have proposed passes through this zone, as far as I can tell - I's have thought that this was a spur from a much larger body of hills, so the ground falling away to the East may rise in the full map. 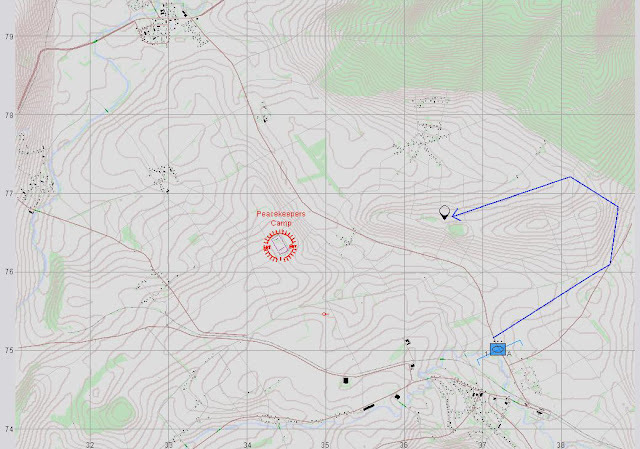 I can't read the terrain too well without the supplementary information given by the point-height under cursor tool, so will sometimes add ridgeline/valley lines using the drawing tools during pre-planning, or when contemplating a move against an 'un-anticipated' enemy force or movement corridor during the mission. I have chronic "CantReadMaps Disease". My point of visually reconnoitiering the terrain still is worth considering too. Mud, rocky, some of the vegetation is not displayed on the map and can make a difference. Copy on the map edges. Will see if it's too problematic. Hi Anonymous, I think there is a BRDM also. I will have to check. There is a BDRM-2 which is crewable and a BTR-80 which is crewable.